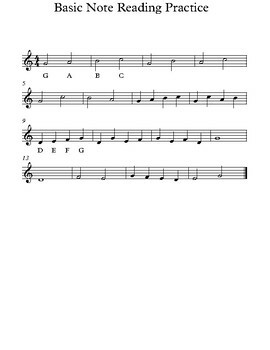 This worksheet gives note reading (letter name) practice for the notes most commonly used by recorder: DEFGABC. The first two lines are GABC and the second two lines are DEFG. The first measure of each group of two lines has the letter names printed under the notes. Whole, half, and quarter notes are used. Most note-reading worksheets only use whole notes, so some students are confused by half and quarter notes, where the stem changes direction. My worksheets are designed to teach reading what they will encounter in "real life" music.